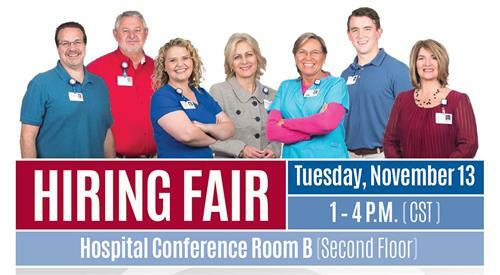 Cumberland Medical Center (CMC) will host a Hiring Fair for clinical and nonclinical opportunities on Tuesday, November 13. It will be hiring for areas such as: food services, housekeeping, imaging, laboratory, nursing, and respiratory therapy. This Hiring Fair will be held on Tuesday, November 13 from 1 to 4 p.m. in the CMC Conference Center located on the second floor of the hospital’s Cleveland Street (pink ribbon) entrance. Appointments are not required. For a full listing of job opportunities, visit www.covenantcareers.com. As a member of Covenant Health, the region’s top performing healthcare network and the only health system in East Tennessee to be named by Forbes as one of America’s Best Employers three years in a row, employees receive excellent benefits as well as a matching retirement plan contribution. Covenant Health is headquartered in Knoxville, Tennessee and is the largest private employer in the area, with more than 10,000 dedicated employees working to improve the health of our communities. For a complete listing of job opportunities at Cumberland Medical Center or to apply for a position online, visit www.covenantcareers.com. Call (931) 459-7022 for any additional assistance in support of the Hiring Fair event. Cumberland Medical Center Conference Center located on the second floor of the hospital’s Cleveland Street (pink ribbon) entrance.